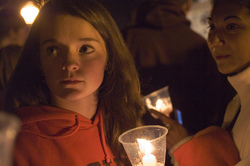 Individuals come to mourn and pay respect to the victims at the vigil at Virginia Tech. 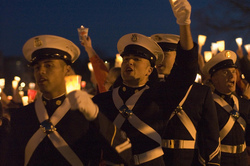 Several cadets attend the Virginia Tech Vigil and participate in one of the various cheers that erupted from the crowd. 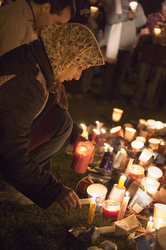 A woman lights a candle near the main memorial site during the Virginia Tech vigil. A panoramic shot taken at the Virginia Tech candlelight vigil. 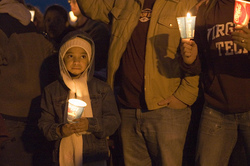 A child attends the Virginia Tech vigil. 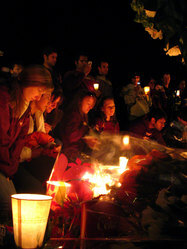 Individuals mourn as they attend the candlelight vigil at Virginia Tech. 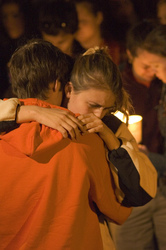 This photo was captured at the Virginia Tech candlelight vigil.